Non UN approved please contact us for details of UN approved options. 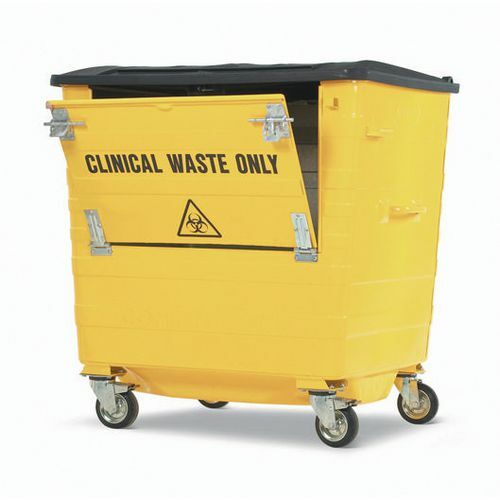 "Galvanised clinical waste wheelie bins, available from Slingsby, provide a sturdy and a safe containment for medical waste. The drop resistant castors give protection and are shock absorbent, helping to prevent waste bags from splitting inside the unit. Our bins come with handles on the side which makes moving them on the four castors easy and allow them to be manoeuvred around corners smoothly. Internally welded seams keep the bins robust and minimise the risk of fluids escaping from them. 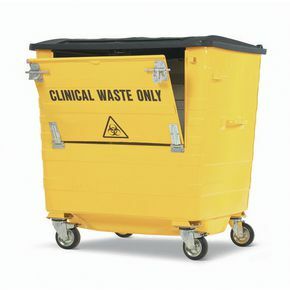 The front of the bins can be dropped down, with two sliding bolts, one on each side to release and secure the drop down panel when not in use. The drop down panel allows for the easy deposit of waste, rather than having to place the waste into the bins over the top rim, a task that some find difficult. Please note these bins are non UN approved; please contact us for UN approved options. Our bins come in two capacities 820L and 1100L with 60 Months Guarantee and Free Delivery."